My most recent jewelry supply order included some great stone chips. I really like the look of the stone alternating with silver tube beads. In the past I used mostly glass seed beads to string the pendants on. Here are some of my newest experiments. The first one is a Barcelona Tile design on glass with shiny resin, red coral chips and silver tube beads. Click on the picture to see the listing in my shop. The second necklace pictured is also a ceramic tile design from Barcelona, Spain. I used coral in this piece as well but the chips are branch shaped and the color is more orange-red than the chips used in the first necklace. Instead of silver tube beads, I used rectangular tube, cream-colored, translucent stone beads. The third pendant is my own tile design on brown translucent glass and also coated with a thick layer of crystal-clear, shiny resin. Oval shaped green stone beads alternate with silver tubes. 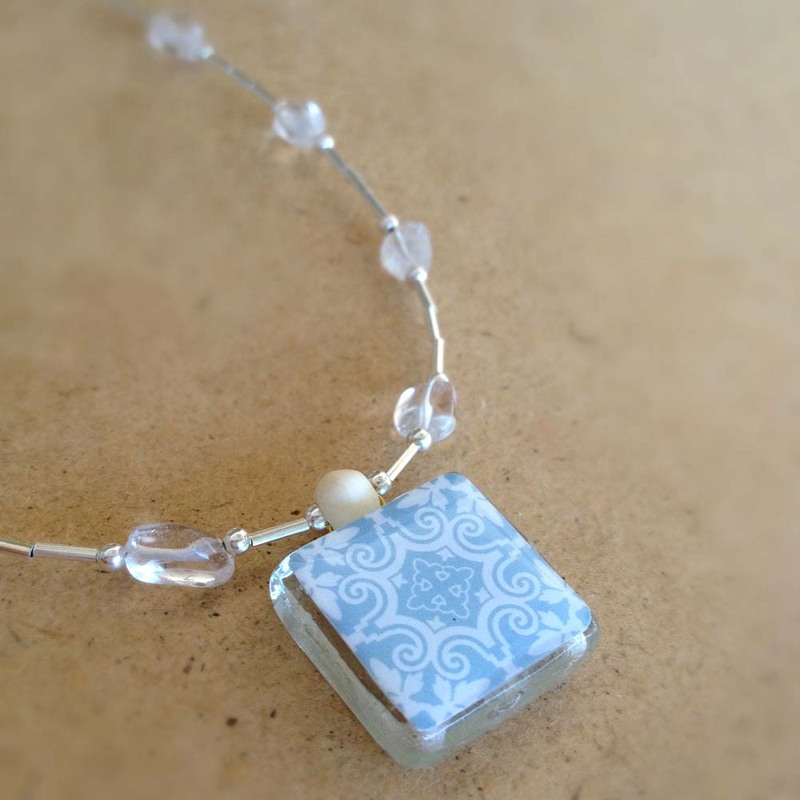 The fourth pendant is a Barcelona tile design in pale blue and white. The stones are clear quartz.